A while back on our website, we put up a video of The Kelly Family, an American group that’s Basque-American at heart. This video was an emotional performance of “Agur Jaunak”, sung at the Loreley Festival in Germany. We wrote about it then because we received the link by email. We’re writing this one today because a Facebook page dedicated to the Basque diaspora, run by a Basque-born US resident, has shared it as an homage to his homeland. This got us remembering history and going over it, and that brought back the incredibly anecdotes told by John Kelly in an interview he gave at the website Euskosare. My father and my mother emigrated from America in the ‘60s, settling down as antique sellers in a town near Talavera de la Reina, where some of us were born. I was the first Kelly born in Toledo. After some eight years there, a friend convinced us to move to Aragón, back in ‘75. We were playing in the town festivals throughout Aragón until we happened to show up in Pamplona with our instruments to earn our living. We went into a restaurant called El Mesón de Caballo Blanco and we sang several songs for the diners. When we started going around with the hat to collect money, a man named Andoni, who was seated at a table with non other than Jorge Oteiza, the sculptor, told a large group of diners to sing “Agur Jaunak” for us. They stood up and that’s when we heard the notes of “Agur Jaunak” for the first time. It had such an impact on us, the perfection of the voices, that my father ended up crying. That group of diners was the Chamber Chorus of Pamplona. That day, my father asked, Where am I? What land have I come to? Who are these people? The other, years after they’d been “Basque-ified,” tells us another incredible story: that of an encounter The Kelly Family had at the entrance to Notre Dame Cathedral in Paris. After coming back from our tour of America, in ‘86, we went to Paris. 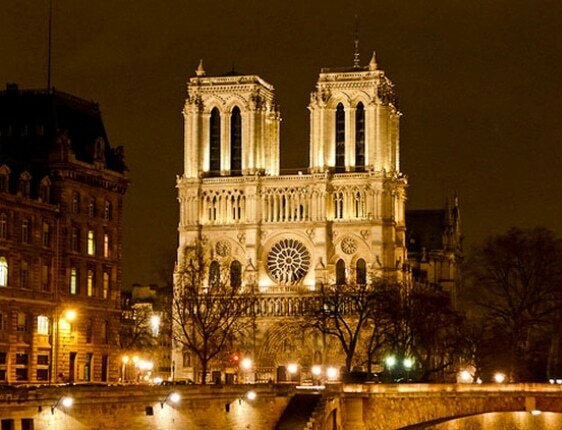 One night, around 2 in the morning, in front of Notre Dame, with the plaza all empty and lit up, we decided to say goodbye to some very close friends by singing them “Agur Jaunak” with the accordion and our voices. In that moment, in a city of 12 million inhabitants, a gentleman just happened to be walking by with two others. They stopped a certain distance away a listened to the song. As soon as it had finished, the man walked up to us, with tears in his eyes, and asked us, full of emotion, “What song was that? Who are you?” He introduced himself as Bruce Springsteen. The plaza was very well lit, but we still had to rub our eyes to really believe that it was Bruce Springsteen, who was so captivated by the notes of “Agur Jaunak” that he ended up giving us his personal telephone number and address. We’re not at all surprised, after reading this, why the American singer has such fondness for the Basque Country. Two stories that mark a life. We’re glad they did so we could have these friends of the Basques–though perhaps it would be more accurate to describe them as Basques among us. We’ll leave you with the link to Basques in Mexico, where the interview can be found. Finally, we’d like to share two videos that we love. One is of the whole group singing “Agur Jaunak”. The other is of John Kelly and his wife, Maite Itoiz, singing “Txoria Txori”.